Goodyear Welted : 25 % of our shoes are made using the traditional Goodyear stitch and are submitted to a strict quality control process. 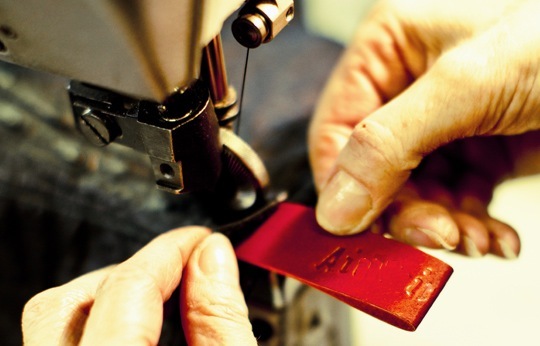 The shoes are made by a team of skilled craftsmen who carefully handle each stage of production. Step 1.Creating the last : The master last-maker creates a wooden mould by hand after completing an ergonomic analysis of the foot to combine comfort and aesthetic appeal. Step 2.Tracing the pattern : This tradition is no longer used by most fabricants of this kind of shoe, but we continue to use it as part of the production process. It consists of drawing the model directly onto the wooden shoe last. Step 3.Creating the pattern : The lines traced on the last in three dimensions are transferred to a two-dimensional pattern that indicates the cut of the pieces of leather and lining for the upper part of the shoe.. Step 4. Selecting the materials : We use meticulously selected materials from only the best sources.They are always stored at the same temperature so that they acquire the texture needed for cutting. We specialise in treating shell cordovan leather, a highly prized animal skin of exquisite quality.